Most bots unlucky enough to find themselves in the sights of Decepticon Blast Off don�t have any idea what�s about to hit them. His preferred method is to attack from orbit, destroying targets with a pinpoint laser strike from high above a planet�s surface. Well, I have zero experience with previous Blast Off toys, and I didn�t really have any liking for the G1 cartoon character. 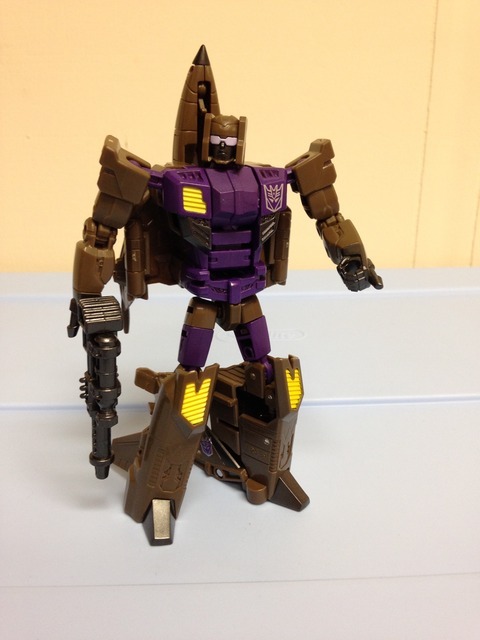 This toy basically fills my �I need to complete Bruticus� slot. He�s a good enough toy for a deluxe, but won�t �wow� you in any aspect. That said, if you�re looking to complete Bruticus as I was (and can�t afford the Unite Warriors version), he�ll do nicely for you. An odd choice from continuity�s sake, but a smart choice from a �save money and repaint� state of mind, Blast Off�s alternate mode is a jet. Where Blast Off used to be a space shuttle (and the Unite Warriors version is), this new version is a direct repaint of CW Quickslinger, and an indirect repaint of CW Firefly. The only real difference is the head, which I will comment on later. Anyways, I actually prefer the jet choice in this case. If you remember the G1 cartoon, Bruticus was a combination of several defunct military vehicles, one of which turns into a space shuttle when Starscream reanimates them. Space shuttle doesn�t fit into the �military� category, whereas all the others (Brawl: Tank, Vortex: Helicopter, Swindle: Jeep/Humvee, Onslaught: Anti-Aircraft Truck) still do. So while purists will argue that Blast Off needs to be a space shuttle, I think the jet mode aligns better in this case, and makes Bruticus a more consistent Combiner. The jet mode is quite sleek on top, and really chunky and robot-y on the bottom. 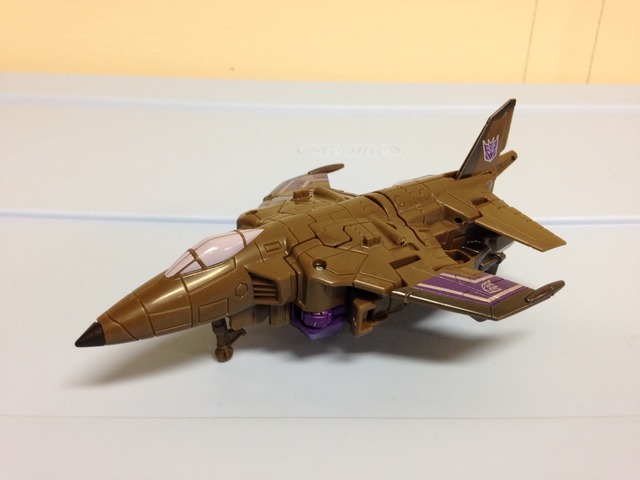 I understand that making a sleek jet in this class while maintaining the combiner functionality would be a challenge, but I can�t help noticing that this is a robot-tacked-on-a-jet figure. That said, it does the job well enough, and isn�t that big of a drawback. The colors are a little funky; brown, purple, silver, and black. Oddly, I think they work well in this case. The base plastic color is the brown, and the others are done well with clean paint apps all around. If you so choose, you can peg the weapons Blast Off comes with under the wings for storage, and there�s a small landing gear wheel in the front to provide some stability. Overall, the jet mode is nothing special, but it manages to work well under the conditions given. Blast Off features a quick and simple transformation just like every other CW figure. There�s nothing new or tricky if you�ve seen a few of these before, but it�s done well and you can get him back and forth with a little fiddling. The robot mode is well balanced, and has a good range of articulation. Most of the joints are ball-type, and offer freedom of movement; nothing is hindered significantly. The only real issue is in the elbow joints, as the one I have has loosened a bit over time. There�s no pin there to hold everything together, and I think the stress on the plastic is the culprit. It�s only in one of the joints, so it could just be the sample that I have. Otherwise, the weight is distributed quite well, and the range of motion offers a lot of poses with little problems. Aesthetically, Blast Off looks pretty good, considering the mix of colors. Blast Off�s brown, purple, black, silver coloration still holds true here, with a tiny bit of yellow thrown in. The mold itself looks nice, and all the lines and details are crisp and well done. 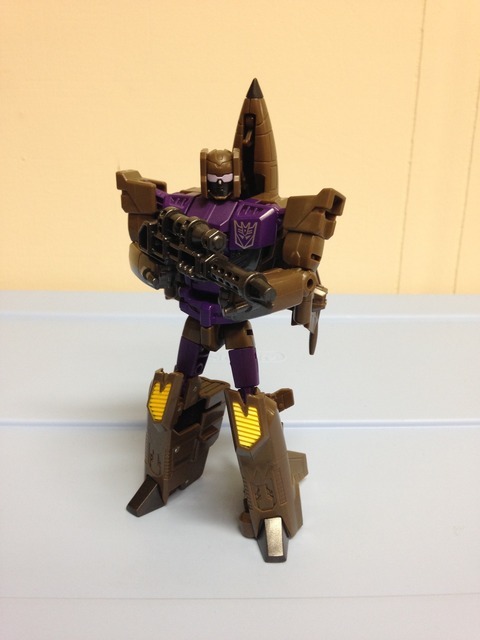 I mentioned the head mold earlier � Blast Off�s head is a repaint of Quickslinger�s, and not of Firefly�s. I can see arguments for using either head: Quickslinger has the �visor� type look in the eyes but an open mouth, whereas Firefly�s eyes are separate but he�s got a faceplate. It would have been good to see a new head that would fit more appropriately, but at least it�s colored as such to match decently well to the original figure. I don�t mind it at all, and I think it looks rather good. Overall, I think Blast Off offers two decent modes with nothing outstanding on either side. You can also use him as an arm or a leg on any combiner, so if you�re loading up of Combiner Wars figures you can find quite a bit to like. Transformation Design: 6 Pretty average and straightforward. Not frustrating by any means. Durability: 7 Good quality plastic, but I have an elbow joint that�s come loose. 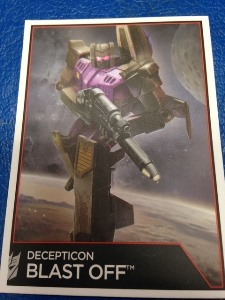 Fun: 8 For the price, you�ll get a couple decent modes, two weapons, and the ability to swap him over whichever combiner you see fit. If you want him as a standalone, that score drops to a 6. Aesthetics: 5 There could be arguments about which alt mode he should have. The colors are a little weird, but work well. And his head is just a tad off. Articulation: 8 Ball and swivel joints galore, and nothing is really hindered. Good range of motion. Value/Price: 8 This ties into the �Fun� category. I was able to get Blast Off at a clearance store, and I have a complete Bruticus. There�s a bunch to do for the price if you plan accordingly. Overall: 6 The true value comes in the eyes of the beholder. As a combiner in a complete Bruticus set, Blast Off is a must. For a standalone, he�s really quite average. Keep in mind that he can always be used with other CW figures, and he�s still pretty solid on his own.